neatComponents provides a complete Windows-based hosting environment with integrated codeless web development software from one download. This means that normally you install neatComponents on one machine and then do everything else from other machines either across your Local Network, or more commonly across the Internet. In this article we will explain about accessing your neatComponents server so that you can get started creating sites and developing them. This is the normal method of working, and is the method used when using an Amazon EC2 cloud instance.. Your web browser (Internet Explorer, Firefox, etc) locates websites by checking the DNS record for the domain. Choose a domain name (or a sub domain), and set its DNS A-Record to the public IP address of this machine. View the "Web Server" tab, and click "Add..."
Select the public IP address from the dropdown, and enter the domain name. This page - A DNS Primer - explains how to set up domain names if you are unfamiliar with the process. The domain name/s must be set to 'Point to...' the public facing IP address of the Internet connection that the neatComponents machine is using. First: Set server to 'listen'. 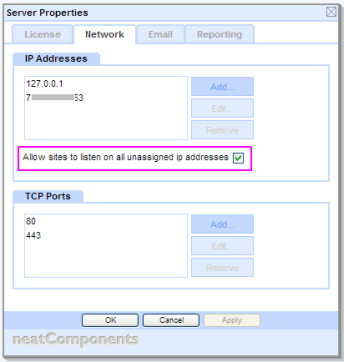 Open the Server node | Properties and check the top-node Server Properties Network-tab is set to 'Allow sites to listen on all unassigned ip addresses'. Set to listen on all unassigned IP addresses. 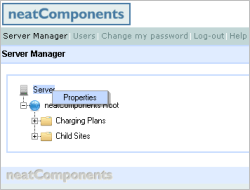 The neatComponents Server Manager will now respond to requests for that domain. You can now access the Server Manager from across the Internet. 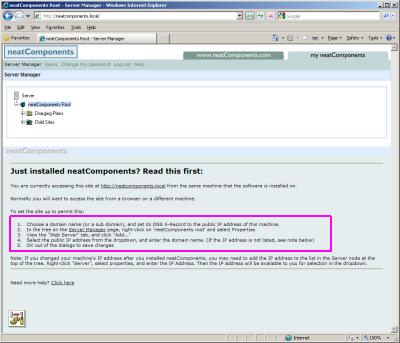 The configuration examples on this page assume that the machine that neatComponents is installed on is on your LAN, and is using Port-forwarding or Network Address Translation (NAT) on your Router or Firewall to transfer inbound connections from your public-facing IP address to the Local (LAN) IP address of the neatComponents machine. If your neatComponents is installed on a machine with direct Internet access - for example, at a co-location or server hosting company, then you would use that public facing IP address in the Domain IP Address in the examples above. This page explains more about working with NAT. You can simulate having an A-Record for testing purposes by using the 'Hosts' file on the machine you are browsing from. Your web browser (Internet Explorer, Safari, Firefox, etc) locates websites by checking the DNS record for the domain, however before the browser looks as an external DNS server it always checks its own Hosts file to see if there is a fixed address for a given domain. This method is detailed here. You need to set a domain or sub-domain to access the Server Manager as explained above - you also need a separate domain name for each website hosted on the server. All domains will use the same IP address (the public-facing IP address of the neatComponents server) in their A-Record. 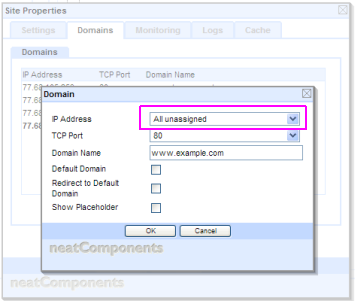 neatComponents uses the actual domain name to differentiate and know which site to serve against each request. 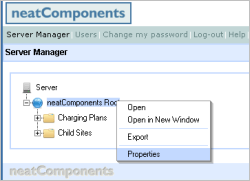 The URL http://local.neatcomponents.com will open the Server Manager, but ONLY if used on the machine that neatComponents is installed onto. The public 'A-Record' for local.neatcomponents.com has been set to 127.0.0.1 or the loopback address to the localhost. Naturally, you must have an active Internet connection for this to work.